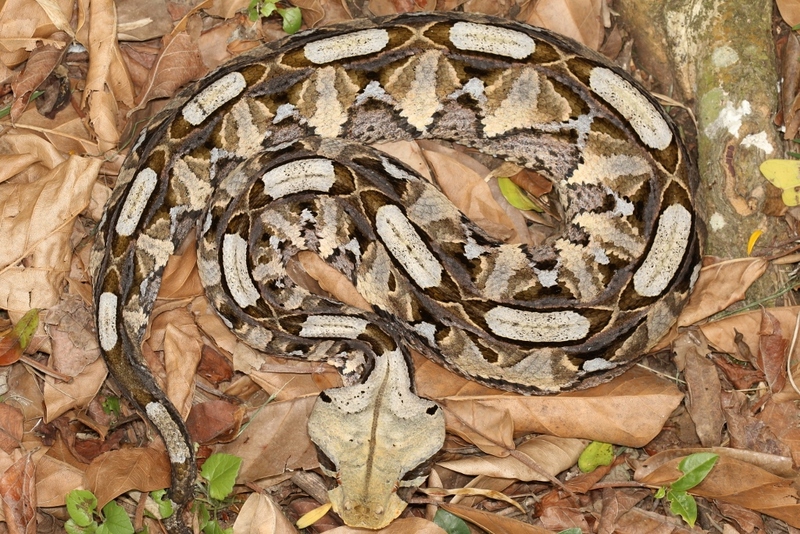 For years I had dreamt of seeing a Gaboon Adder (Bitis gabonica) out in the wild. It has to be one of the most beautiful snakes in the world! 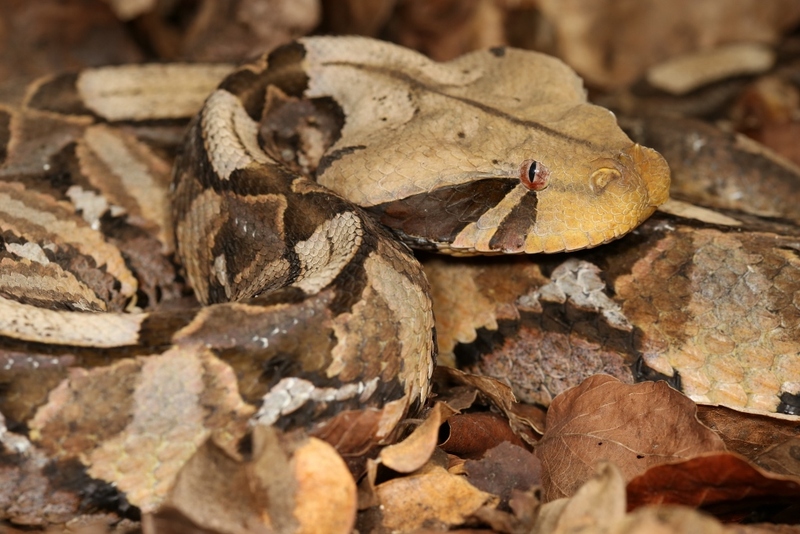 It captivates many, and sparks interest, even for those who don’t like snakes. But they are seldom seen snakes, and seeing one usually requires a lot of time out in the field, and of course, a bit of luck! I have spent around three years driving up to, and exploring Northern KwaZulu-Natal. I was mostly not focused on finding Gaboons, because realistically, I knew the failure rate would be high. I was just looking for any snakes and frogs, no matter the species, and enjoying the beautiful scenery of the region. But the Gaboon Adder was still number one on my list to see! I would come across many amazing snake species on these trips. During the day, I had encountered a few Forest Cobras (Naja melanoleuca), and the harmless green snakes from the genus, Philothamnus. At night time, whilst out road-cruising, I came across some really pretty species, such as Southern African or Rock Pythons (Python natalensis), Puff Adders (Bitis arietans), Egg-eaters (Dasypeltis spp), File Snakes (Gonionotophis spp), and some of the smaller, fossorial species, like the Shovel-snout snakes (Prosymna spp). These more than made up for no Gaboon sightings! Plus, I saw some stunning frog species too. So I was very happy. Although to be honest, I spent slightly more time in areas on the fringes of the Gaboon Adders distribution, than in their prime habitat. So that didn’t exactly boost my chances! 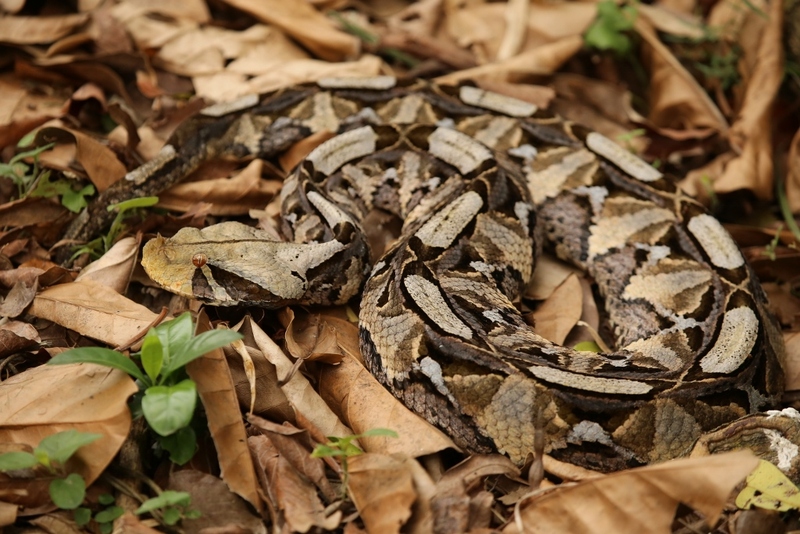 Gaboon Adders, in South Africa, are a coastal species, residing in dune and swamp forests. They can also be seen hanging around moist grasslands, on the forest fringes of these areas. Sadly though, like all wildlife, this beautiful creature is under threat. Their already small distribution has shrunk over the years, no thanks to habitat destruction. They are killed on the roads, and also by the hands of fearful people. Gaboon Adders are sought after in the pet trade as well, due to their impressive size and beautiful colouration. Thankfully, they are a protected species, so one cannot legally go out and capture them to sell them, but unfortunately some do get taken out of the wild, inevitably. On the plus side for this species, most of its distribution in South Africa falls into the protected Isimangaliso Wetland Park, where they are relatively safe, and numbers are stable. Phew! Finding one, while walking in the bush during the day, would require some great luck! 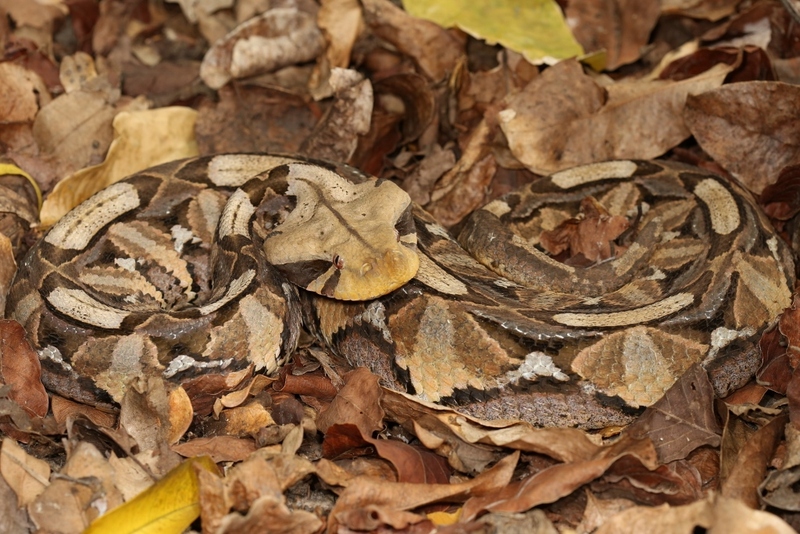 Their cryptic colouration and camouflage is world class – they just seem invisible while lying amongst the leaf litter! They are perfectly adapted to blend into the forest floor. I had tried scratching around for them in suitable habitat, but with no luck. I figured road-cruising at night time would be my best bet. Then, with my girlfriend (now my fiancée, Joelle), I decided we’d go up to a beautiful part of the Isimangaliso Wetland Park, in Northern KwaZulu-Natal. After an early dinner, we hit the road in search of snakes. I recognized a vehicle approaching as that of a friend. We stopped, and had a quick chat to see who had seen what. Then, my friend in the passenger seat of the other car shouted ‘Snake!’ We all jumped out, and to our surprise, there was this big Gaboon Adder about to cross the road! We were all screaming and shouting like overly excited children! How’s that for a lucky sighting?! We moved it off the road, photographed it, and let it go on its way. Maybe Joelle was my good luck charm? Well as it turns out, I think she is. A few months later, we returned to the same area for Joelle’s second time. Again, routinely, we had an early dinner and hit the roads. This time however, I was in a very grumpy mood. We weren’t seeing anything, but that’s not what bothered me. What did was the fact that some of the locals were having parties in this particular conservation area, loud music, alcohol, and worst of all, speeding vehicles. I was fuming! Then, as we were going up a small incline, we saw something large lying ahead on the road. “Python!” we both exclaimed and thought. But as we got closer, we realised that this was no python, it was another Gaboon Adder – Woohoo! It was huge, as you could judge by our confusion of it being a python from a distance. Feeling so grateful that none of the noisy party-goers had run it over (which they inevitably would have done), we quickly moved it off the dangerous road. Again, we photographed it and let it go on its way again, hoping that it would keep well-clear of the road again! I couldn’t believe it. After all my visits and time searching for these snakes, Joelle comes with me on two night drives and finds two! Then she had the cheek to say, “I’d love to see a leopard now, I’ve seen Gaboons now.” Humph! In my two encounters with Gaboons, I had learnt a bit more about them, and it was great to experience their behaviour. They’re really placid snakes, with a very calm temperament (although please do not test one). These two made no attempt to bite. For such a highly venomous species, that is a very good thing! I think I fear a bite from a Gaboon Adder more than any other snake species in South Africa, including that of a Black Mamba. They have a combination of venoms (neurotoxins, haemotoxins, and predominantly cytotoxins), and they can also inject large volumes of venom. A full envenomation will most definitely kill you without urgent medical attention. From what I have heard, it is a painful experience to say the least (as told by people who were bitten while working with them, not standing on them). Fortunately though, bites are very, very rare. That’s because of how scarce this species is, and their reluctance to bite. A lot of people get very nervous walking through coastal forests where Gaboons occur, but there’s little need to tread with fear. The chance of stumbling upon one, and then being bitten, are next to none. Just enjoy your walk! Gaboon Adders are heavy bodied snakes, and lifting one up with a hook is not quite like picking up any other snake, other than a python. I learnt that with our second find. So they’re not exactly fast-moving snakes or the most agile either. But they don’t need to be. 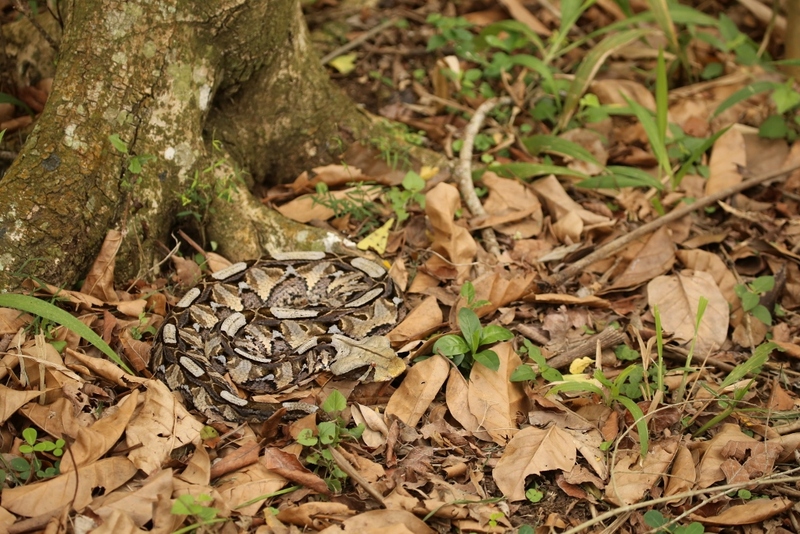 These snakes are ambush predators, relying on that amazing camouflage to lie in wait for a small mammal or bird to move past. It lies motionless, but as soon as that prey item moves past, it strikes out in the blink of an eye, and then its game over for that animal. It’s not a snake that eats very often, like a Black Mamba for example. It’s an opportunistic feeder, and can live off a few large meals in a year (like many other snake species). They actually don’t move much at all either. I have heard stories of these snakes moving between the space of a few meters in a period of a few months, just moving to the sun to bask, and back into the shade. The males will, during mating season, move around quite a bit in search of a female. The two that I found were both males, as could be told by their long and more slender tail. Photographing these two specimens was a joy! They sit still, probably thinking that you can’t see them as they lie in the leaves. And their colours and patterns are just outstanding! It was so great to see them up close. They look way better in person than in pictures! My two Gaboon Adders were truly unforgettable moments. From the initial joy of seeing it, to watching it go back off into the bush, they are and will always be special memories for me, and I hope to come across another one sooner rather than later!